Models 1452, 2902 and 6502 are designed for mounting directly to a facility's structural steel by means of compression clamps. The machine's output shaft is coupled directly to a solid steel shaft (Model ST-1) and is supported by flange bearings (Model BBA-3) along its length from a common structural steel member. Powder coated steel spools or Yo-Yo drums are fixed to the steel shaft and the individual lift lines are then attached to these spools or drums. These units are equipped with motors which provide instantaneous stop, start, and reverse action from any point of travel. 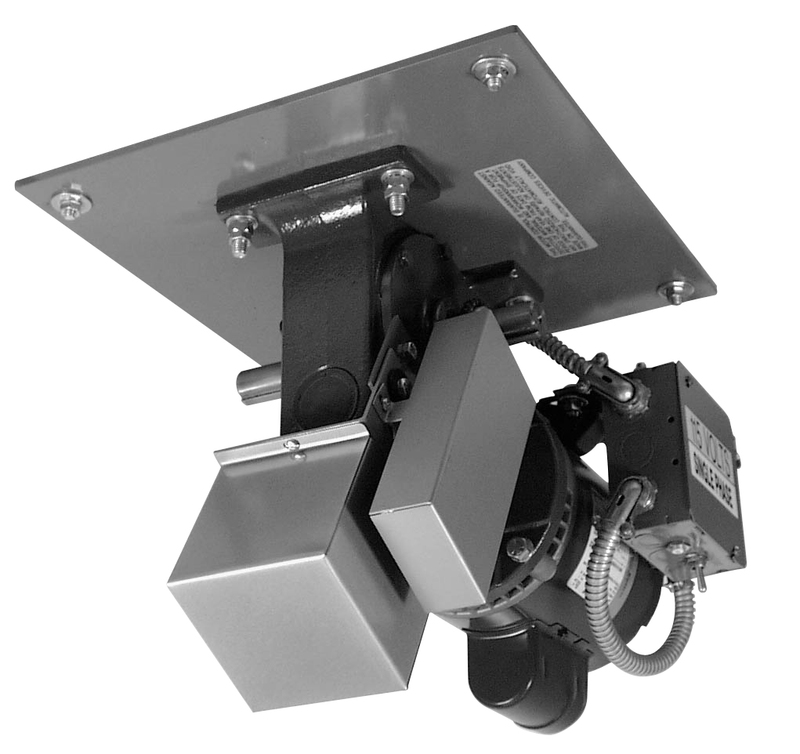 Integral rotary limit switches provide user definable pre-sets for the "Full Raise" and "Full Lower" positions. The exact size of the supporting stuctural member must be supplied at time of order. Model designation is for machine only. Line shaft, couplings, bearing brackets and spools available separately. Two shaft sizes (1" and 1-3/8") are available with the size determined by the load and span of the system. Model differences are based on horsepower of motor used. Configuration and size is same for all models. Channel Mounting Base - 14" x 14"
Curtain machines shall be fully automatic type equipped with ... HP reversing motor directly connected to single reduction gear unit. Remote control switch shall provide reversing action at any point along elevated travel and shall be composed of three-position, maintained toggle-type switch. Integral rotary limit switch shall be driven from output shaft of gear reduction unit. Machine shall be equipped with disconnect switch and overload protective breaker. The entire mechanism shall be mounted on a steel base. Model ... as manufactured by Automatic Devices Company of Allentown, PA.